Winning the grand prize was totally unexpected, especially when I personally believe there are better and more experienced bloggers among us. Needless to say, I have learnt a lot from them throughout the programme and would continue to learn from these amazing guys. Do check out their blogs, follow their travels and adventures, and you'll see how we are all winners in our own way. Once again, thank you Tourism Selangor, My Horizon Media Sdn. Bhd., the organiser of My Selangor Story 2013 and all sponsors (incl. 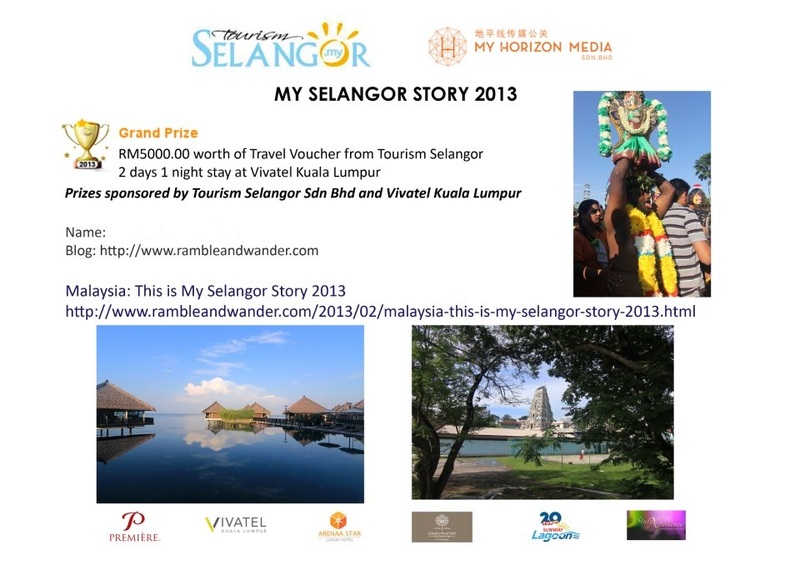 AstuteXperience, Sunway Lagoon, Premiere Hotel, Arenaa Star Luxury Hotel, Golden Palm Tree Iconic Resort & Spa and Vivatel) for making My Selangor Story 2013 a reality, not just for me but also for 19 other bloggers from both Malaysia and Indonesia. For a more complete story of the experience that was My Selangor Story 2013, you may start with the summary here. I think I told you before that you'll win this contest. Ingat tak? hahaha..
my instincts are always strong. btw congratulations! Hahaha! Yes, you did. Next time I'm going to do anything, I'll ask you again for your instincts, heheh!